This report is about each and every one of us. The scale of the privacy intrusions revealed by National Security Agency (NSA) whistleblower Edward Snowden is such that hardly anyone, anywhere with an Internet connection has remained untouched. Internet Voice: “Protection of privacy and strong safeguards and oversight of any collection of private data is of paramount importance if our democracy is to thrive. We cannot forego our privacy out of fear. - Brent M.
*“Internet Voices” come from the over 10,000 people who have used OpenMedia’s Crowdsourcing Tool (found at openmedia.org/privacyplan), attended an OpenMedia crowdsourcing event, or spoke out on OpenMedia’s social media platforms to submit comments as part of this process. We quote these everyday Canadians throughout the report to bring more attention to the lived experiences of Internet users with privacy issues. All this with little grounds for suspicion, no warrants, and no independent oversight. On top of this, Canadians have seen the federal government introduce a suite of legislation — Bills C-51,4 C-44,5 and C-136 — that amount to a sweeping expansion of the surveillance state and a disturbing dismantling of Canadians’ privacy rights. It’s clear that Canadians are concerned: Over 94.1% now want a Parliamentary Committee to conduct a comprehensive review of existing oversight mechanisms. Supporters like Brent inspired us to create “Canada’s Privacy Plan”. At OpenMedia, participatory values are at the heart of everything we do. We believe the best ideas come from our pro-privacy community of engaged citizens — the people whose lives are impacted the most by reckless government policies. Canadians have told us they feel disempowered by their government; we empower them by providing the tools they need to push back. That’s why we worked with some of this country’s top privacy experts in the large, non-partisan Protect our Privacy Coalition7 to craft a crowdsourcing tool, along with other online tools and offline dialogues, to give everyone a say in shaping this report. The crowdsourcing tool was then used to ask Canadians some straightforward questions: What is most important to you when it comes to privacy? What will it take to tackle our privacy deficit? What safeguards do you think are necessary to protect our human rights in a digital age? The response we received was overwhelming —over 10,000 Canadians took the time to share their views with our drag-and-drop crowdsourcing tool, often in great detail, as part of the over 125,000 people who engaged with our privacy work overall. Their collective input determined both the direction and recommendations of this report. We will highlight direct quotes from these everyday Canadians throughout. 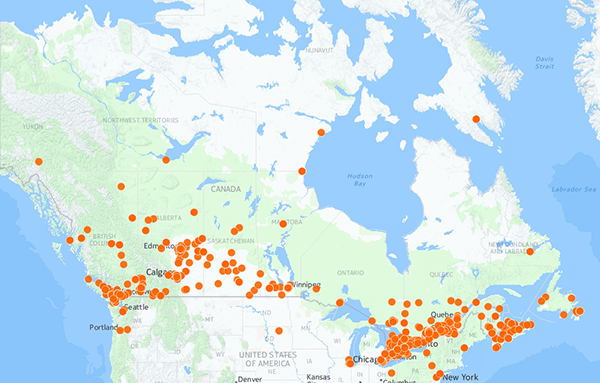 “Participants who used our drag-and-drop crowdsourcing tool, by anonymized IP address - Canadians in every province and territory helped shape this report. Our crowdsourcing process identified three key concerns that Canadians want to see addressed in order to tackle our privacy deficit: i) warrantless access to personal information, ii) widespread dragnet surveillance of entire populations, iii) insufficient oversight and accountability of surveillance activities. From their input, and the many other elements of our crowdsourcing process, we have distilled three key recommendations. Canadians strongly support the principle that the government should be required to obtain a warrant to access their sensitive, personal information. 93.8% said such searches are only permissible when a judge grants a warrant based on evidence that a crime is soon to be, or has been, committed. When Canadians were asked to rank six privacy priorities in order of preference, “Require a warrant” came first, with fully 68.9% choosing it as one of their top three priorities. Given these strong sentiments, our first recommendation focuses on how to end warrantless surveillance by the government. We outline ways to safeguard Canadians’ privacy, such as by ending legal immunity for the ‘voluntary’ warrantless disclosure of personal information, stronger reporting and transparency mechanisms, and tougher privacy laws to ensure government agencies use personal information strictly for the reason it was provided. These measures would roll back widespread warrantless surveillance, and create stronger judicial safeguards to protect every Canadian’s private life. Canadians expressed strong opposition to mass online surveillance, with fully 68.9% choosing “End Blanket Surveillance” as one of their top three key privacy priorities. 89.1% want to make all surveillance activities require a warrant approved by a judge against a specific target. 92.2% also said the government should not be monitoring law-abiding individuals and organizations not posing any known threat to national security. Our second recommendation focuses on ending suspicionless mass surveillance. We propose an audit of all ongoing surveillance activities, halting any that involve the warrantless collection of Canadians’ personal information, including the bulk collection of metadata. We also propose that surveillance activities, including those by the Communications Security Establishment, require judicial not political authorization. We also call for an end to the government’s practice of collecting and analyzing Canadians’ social media posts. Canadians overwhelmingly support much stronger accountability, oversight, and transparency for government surveillance activities. 94.1% want a Parliamentary Committee to conduct a thorough review of existing oversight mechanisms. 91.8% want the CSE to produce regular unclassified reports, detailing how often the agency intercepts Canadians’ personal information. 88.2% agree with the Privacy Commissioner that spy chiefs should testify regularly before Parliamentary committees. 87.9% want an independent body to oversee spy agencies and issue regular reports to the public. We propose a range of measures to tackle the oversight deficit, including ensuring strong, independent oversight and review bodies for the CSE and the Canadian Security Intelligence Service (CSIS). We call for a cross-party Parliamentary Committee, elected by secret ballot of all MPs and chaired by a member of the largest opposition party, to conduct ongoing review of spy agency activities. We also propose reining in the steep costs of surveillance, by requiring the Parliamentary Budget Officer and Auditor General to develop clear cost projections for surveillance activities. The following are the concrete policy proposals of the Canada’s Privacy Plan project. The full report gives more plain-language explanations of how these policies would work, and the impact they will have. The Protect our Privacy Coalition consists over over 60 organizations, two dozen academic experts, and over 40,000 Canadians. It supports strong, genuinely transparent, and properly enforced safeguards to secure privacy rights. The coalition calls on Government to put in place effective legal measures to protect the privacy of every resident of Canada against intrusion by government entities.